CHICAGO – Nothing forms the basis of a friendship quite like a shared understanding. When the hearts and minds of two people are compatible. everything else falls into place. It doesn’t matter if one happens to be a 52-year-old woman and the other is a 19-year-old man. That’s one of the simple truths that “Nate & Margaret” illuminates without drawing too much attention to it. The ages of Margaret (Natalie West) and Nate (Tyler Ross) are irrelevant. When they’re first seen browsing through a thrift store with a mixture of curiosity and amusement, their chemistry is immediately apparent. It’s clear that they provide each other with a sense of comfort and completeness that they haven’t found with anyone else. Yet as both friends reach pivotal transitional points in their lives, their tight-knit relationship threatens to stunt their growth. Only on their own can Nate and Margaret truly explore their identities as individuals. Only then can they realize just how important they are to each other. This is a wonderful feature directorial effort from Nathan Adloff, an actor perhaps best known for his deft and uninhibited work in Joe Swanberg’s web series, “Young American Bodies.” He’s the sort of performer who seems incapable of conveying an inauthentic emotion onscreen, so it’s no surprise that he was able to coax uniformly excellent performances from his cast. West, the “Roseanne” vet who recently emerged as one of the great gems of the Chicago stage, is a stitch as Margaret, an aspiring stand-up comic whose oversized glasses and cantankerous voice seem primed for laughs—if only they would arrive. Her punchlines land with a cavernous thud and Adloff nails the squirm-inducing agony of a set gone horrible wrong. It’s only after Nate encourages her to embrace the tragic aspects of her past that her material starts to improve. Yet when she peers out into the audience, Nate’s face is no longer there. He’s met someone, and his name is James (Conor McCahill). Will he become Nate’s first boyfriend? It’s a credit to the script by Adloff and Justin D.M. Palmer that Nate’s orientation registers as no less noteworthy than the age difference between him and Margaret. Gone are the stereotypical tropes and the self-conscious speechifying that permeate one too many “gay movies.” There isn’t a frame of this film that couldn’t be deemed universally relatable, and Ross’s performance is the glue that holds it all together. He exudes just the right amount of vulnerability in scenes where Nate experiences the newfound thrill of intimacy as well as the wrenching anguish of disillusionment. Natalie West and Tyler Ross star in Nathan Adloff’s Nate and Margaret. Amidst the many amusing and warmhearted scenes in “N&M,” there are a handful of laugh-out-loud moments, particularly during the otherwise excruciating restaurant showdown in which Ross undergoes a heartbreaking transformation. During the film’s climactic confrontations, the dialogue is a bit on-the-nose, yet the actors consistently keep it grounded—especially Ross, who allows the words to tumble out of his mouth faster than his character can register them. After all, it’s the people who are closest to us who we often tend to hurt the most. The scenes between Ross and McCahill impeccably portray the imbalance of expectations between a virginal youth and his more experienced partner. Nate’s pointed line, “Sorry I’m not gay enough for you,” is bound to resonate with viewers who’ve felt like they didn’t live to up the standards of another lover. McCahill never overplays his character’s slick nuances, and allows his true nature to be revealed during a mesmerizing dinner scene (it seems that practically every meal sequence in an Adloff movie is a recipe for indigestion). There’s also an unforgettably beautiful moment where two alienated characters in disparate parts of the city are linked by a fireworks display. With its exuberant score, crisp visuals (lensed with the RED camera) and stellar ensemble (including Gaby Hoffmann, who savors every ounce of her scenery-chewing cameo), “Nate & Margaret” is one of the most purely enjoyable films this year. It’s also one of the most poignant odes to life-altering friendship in recent memory. I can’t wait to see what Adloff does next. 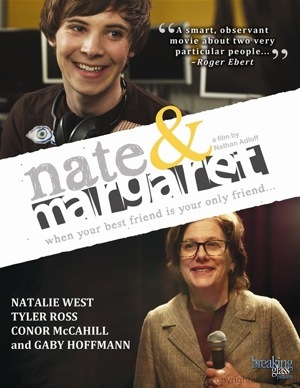 Nate and Margaret was released on DVD on August 28, 2012. Yet what make this disc a bona-fide winner, above all, are its three audio commentary tracks that analyze the footage from strikingly different perspectives, thus providing a well-rounded look at the collaborative process of filmmaking. The track with Adloff and Palmer details how the project evolved from an autobiographical look at apartment life to a semi-autobiographical vehicle for West. Throughout it all, the writing duo preserved their overarching message that “friendship love is sometimes more important than romantic love.” They also reveal the invaluable contributions of cinematographer/editor Brian Levin, who switched the opening scene from the party where Nate and James first meet to Nate and Margaret’s Goodwill shopping spree, thus allowing the film’s real love story to be placed front and center. Levin joins Adloff and production designer Chelsea Warren on a separate track and discusses his various bits of invisible effects work, from the fireworks juxtaposed against the Chicago skyline to a generic label concealing a trademarked brand of box wine. The final track, reuniting Ross and West with Adloff, is a total charmer and can be viewed as picture-in-picture commentary. Ross proves to be just as infectiously giddy as his character, at one point exclaiming, “Moviemaking is so much fun!” He cringes through Nate’s nasty outbursts and admits that he couldn’t help crying while filming the restaurant scene. It’s that precise level of emotional commitment that has made him one of the most promising actors of his generation. ‘Nate & Margaret’ is released by Breaking Glass Pictures and stars Natalie West, Tyler Ross, Conor McCahill and Gaby Hoffmann. It was written by Nathan Adloff and Justin D.M. Palmer and directed by Nathan Adloff. It was released on August 28, 2012. It is not rated.